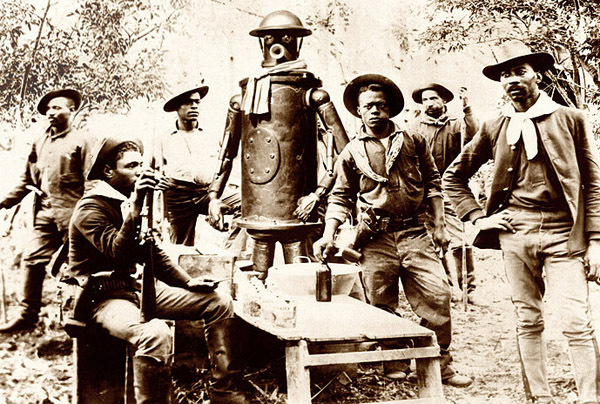 Pancho Villa poses with Boilerplate in this photo taken near Guerrero, March 27, 1916. On March 16, 1916, Pancho Villa led a raiding party that attacked Columbus, New Mexico. They came away with very little, but Villa's intent was for political, not material gain. Mexico was politically divided between the U.S.-backed Carrancistas (who were in power) and the Villistas (who were rebelling against them). Pancho's hope was to trigger a U.S. military intervention in Mexico that would rally peasant support behind the Villistas. Villa's plan worked: days later, President Wilson sent into Mexico a U.S. Army Punitive Expedition under the command of General Pershing. Pershing's orders were to capture Villa and/or destroy his forces, and he was prepared to use the latest technology at his disposal. Included in his requisition were the newly formed 1st Aero Squadron, Vickers-Maxim machine guns, and what the general refered to as "Roosevelt's mule": Boilerplate. Pershing first saw the mechanical man in action during the assault on San Juan Heights in the Spanish-American War, and was impressed with its abilities. As seen in the above photo, Boilerplate was attached to the all-black 10th Cavalry (of San Juan fame), under Colonel Brown, for the purpose of long-range reconnaissance. Flying columns of the 10th pushed down into the Santa Maria Valley, toward El Valle. On March 19, Boilerplate was scouting along the general campaign route, nearly 80 miles south of Colonel Brown's position, and entered Namiquipa. 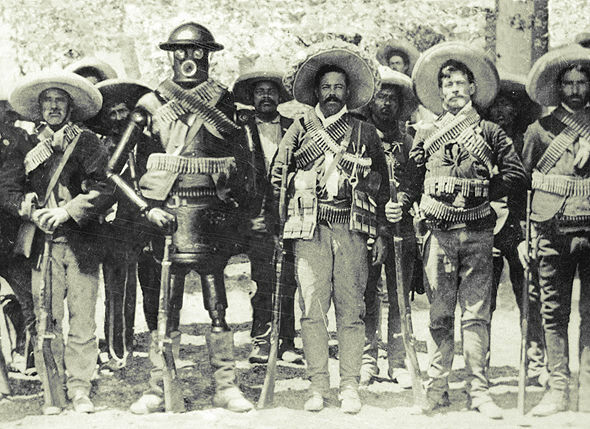 There Boilerplate encountered Pancho Villa and his men. "Suddenly there was a great commotion. Someone cried out that an American soldier had been captured just north of town. This soldier was being led to the hotel where Villa was headquartered. I went outside to see for myself, and a stranger sight I have never witnessed in my life. This American was not a man at all, nor did it seem possible this being could ever be held by any jail, for he was made entirely of metal and stood a head taller than anyone around him. A large blanket was fastened around his shoulders, so that from a distance he appeared as an ordinary peasant. I learned later that lookouts north of the town had tried to stop this metal figure with rifle fire as he approached. The bullets were like mosquitos to this giant, who, instead of retaliating against the attackers, simply asked to see their leader. Thus he was led down the main street by the lookouts, accumulating spectators as they made their way to the hotel." The unusual meeting lasted for two hours. When it was over, Villa gave the order for his men to leave Namiquipa and head south. Whether Boilerplate gave intelligence on maneuvers of the 10th Cavalry is unclear, but Villa was informed by a scout that 200 Carrancista soldiers were closing in on his position. After riding a few miles, Pancho realized that his troops outnumbered his opponent two to one, and they turned about to engage the enemy. After a fierce firefight, the Villistas defeated the Carrancistas. The following day, Pancho and his men marched out of town with 100 new horses and a pair of machine guns. Boilerplate remained in Namiquipa. Two days later it was reunited with its assigned unit when the 10th Cavalry arrived in town. "Roosevelt's mule" informed Col. Brown of Villa's intent to attack Guerrero, nearly 100 miles to the south. Between these two towns were a maze of canyons and mountains that topped 11,200 feet. And Pancho had a 50-hour start. Col. Dodd and the 7th Cavalry (of Custer fame) were also bearing down on Guerrero, a Carrancista stronghold. But it was Boilerplate that reached the town before any U.S. forces. On the 28th of March, the mechanical man found itself in the middle of a firefight between Villistas and Carrancistas. At this point Boilerplate inadvertently became a lynchpin in history. During one of Villa's charges on an enemy position, a machine gunner had a clear shot at Villa. Boilerplate positioned himself between the fusillade and its intended target. Out of a dozen rounds fired, only one hit Pancho in the leg. The mechanical man had prevented the death of General Villa. The Villistas took Guerrero, but Pancho left town on a stretcher that evening, He could not chance being captued by the Americans. The next day, U.S. Cavalry forces arrived; in the subsequent battle, they took the town and killed nearly 50 Villistas. Pancho hid out in the mountains, recuperating and reorganizing. Boilerplate provided no further intelligence about Villa's movements and was sent back to the U.S.
General Pershing never caught Villa, and was eventually ordered to leave Mexico. The Carrancistas were ousted from power in 1920; their successors granted Villa a pardon. Three years later, Pancho was shot in a quarrel over money. 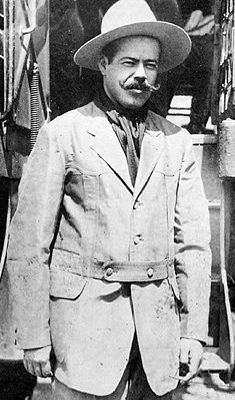 Pancho Villa is one of only two foreign militia since 1812 to attack the United States and get away with it.